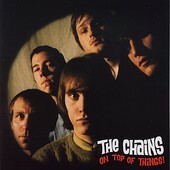 In Music We Trust - Chains, The: On Top Of Things! From the opening stomp of "Her Name Is Love", a sweet, melodic albeit dirty rock song. Through the fun-time bounce of "Baby What You Want Me To Do", The Chains re-live rock 'n' rolls glory days with a sound that is as much The Rolling Stones and The Beatles as it is Chuck Berry and Buddy Holly. It revels in the history of rock, doing exactly what bands did in their early days, wrote songs about what they knew. The songs in those days were catchy and you could sing along with them. They incorporated everything from garage to the blues, while ensuring that no matter what was being done, it was always fun. On Top of Things! is fun, a look into the humble beginnings of rock 'n' roll, served up raw and with a smile. I'll give it an A-.